As we observe the Health & Healing Week(Feb. 9th to 16th), we approach you to come forward to support our endeavour in setting up a Holistic 25-Bed Palliative Care Centre at the Catholic Health Association of India (CHAI), Hyderabad. 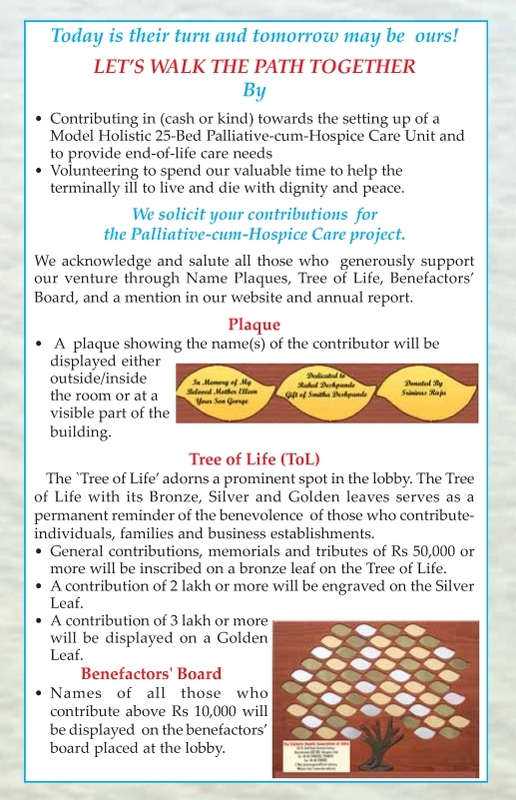 Yes, it’s time to give, accompany the terminally ill patients through relieving pain with medicines and by providing other psychosocial and spiritual support as well as helping families to cope with the situation. 6 million people in India are in need of palliative care a year. Only less than 2% of them are currently covered under any form of palliative care services. Many of the health care workers and families of patients are ill equipped to handle their needs. Medical, psychosocial and spiritual care and support to over 300 marginalized and terminally ill patients and their family members annually. Organize a ‘whole-person’/interdisciplinary palliative care training programme for doctors, nurses, social workers and community volunteers. Build a caring community of active volunteers to accompany the patients and their families. ‘Resurrection’ may also mean to help the one down with suffering from sickness and sorrows, to be hopeful, to be resilient with new shoots in life. That is exactly what the Lord meant saying, “Whatever you did for one of the least of these brothers of Mine, you did for Me” (Mt. 25:40). “Give, and you will receive” (Lk. 6:38). All your contributions are exempt from Income Tax under 80G of IT Act. 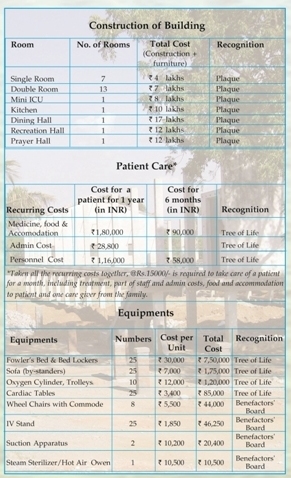 For details on the various components to which you would like to contribute, please see the brochure below. May God Bless you all with His Peace and Love!